Zander Dyer has been involved in sports as long as he can remember. “I’ve always been passionate about sports and being part of a team,” he says. “I view it as a second family.” Yet as he grew older and hit puberty, he began to feel dissonance between himself, his body and other players. For a time he moved away from athletic competition to cope with his gender dysphoria. When Zander began his transition to male as a young adult, he began to miss the family he once found in athletics. He worried, however, that he would be unable to find a league supportive of his gender identity. 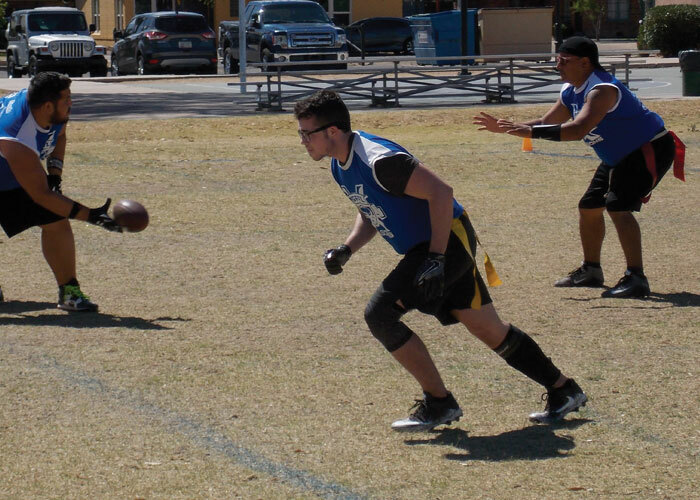 Then he joined the Phoenix Gay Flag Football League (PGFFL) which he happily discovered “includes everyone who wants to play.” Zander regained the sense of camaraderie that he had long been missing. He joins an ever-growing group of young athletes who feel supported in their transgender identity by their local leagues. As advocates debunk erroneous assumptions about trans athletes competing and people like Zander increase visibility for trans players, opportunities for competition are growing, regardless of gender identity or expression. In the early twentieth-century transgender athletes were neither visible nor openly admitted into athletic leagues. The reason behind their exclusion was predominantly misinformation; competitors worried that players would “disguise themselves” as the opposite gender to gain an advantage. These fears increased when Olympic high jumper Dora Ratjen revealed he was designated male at birth following the 1936 Summer Olympic Games. As a result, many sports organizations required female athletes to undergo physical inspection by a team of doctors to confirm their biological gender. Neither transgender women nor men were allowed to compete on professional teams because of supposed hormone advantages. An additional problem was widespread use by many national and international sports leagues of the original International Olympic Committee (IOC) transgender competition guidelines. They required external and internal gender reassignment surgeries that most U.S. surgeons were unwilling to perform and even fewer athletes could afford, even if they had wanted them. Fortunately, that has changed for the better. For those who do want gender reassignment surgery, there are a number of surgeons who now offer their skills to help transform the outside body to meet a patient’s known gender identity. Babak Dadvand M.D. is a plastic surgeon specializing in male breast reduction (gynecomastia) and transgender top surgery. Always looking for purpose in his life, Dr. Dadvand says “I want to know that I am not just improving how someone looks but also improving their quality of life.” And as an athlete himself, he also understands the important balance sports bring to his life as well as the lives of his patients. Questions about hormone advantage have already been medically answered. Transgender men injecting testosterone reach levels identical to that of a cisgender man, giving them increased strength and endurance when competing against male players. Transgender women who undergo hormone therapy, on the other hand, experience a drop in their testosterone levels. While their muscle mass decreases, fat redistributes into curves, and bone density shrinks. Even though in most measurable ways their physical ability mirrors that of a cis woman, trans female athletes still face a barrier when trying to compete with other female athletes. Over 40 years ago tennis player Renee Richards was barred from competing in the U.S. Open after refusing to take a chromosome test required for female players. One year prior, Richards had undergone gender reassignment surgery and began living openly as a woman. With the support of her fellow tennis players, including tennis legend Billie Jean King, Richards was able to sue the U. S. Tennis Association for gender discrimination. After a favorable court verdict she was able to compete in the U.S. Open and other professional matches but she still faced discrimination. Richards received insults and death threats from outraged tennis fans, and some of her competitors walked off the court when she was announced, refusing to compete with her. Although Zander has not experienced such hostility, he hasn’t always felt he fit in with his teammates. While he has felt “less than” fellow football players, he considers it a reflection of personal insecurities. “It’s easy to get caught up in societal standards of what a man is or isn’t supposed to be,” he says. “But what it all boils down to is that everyone is different, regardless if you’re cis or trans. There will always be someone who’s more skilled than you and there will always be someone you’re more skilled than. It’s a matter of working on your weaknesses and sharing your strengths with your team/teammates.” The more he plays in the PGFFL, the more he feels like just another one of the guys. Olympic gold medal-winning track runner Caitlyn Jenner brought trans athleticism into the spotlight when she came out as transgender in 2015. Initially competing as a football player, Jenner turned to track and field as a college student. Her mentors encouraged her to train for the Olympic decathlon and in 1972 she placed third in the Olympic trials and tenth in the Munich Games. After intense training, she won the decathlon in the 1976 Olympic Games and set a third successive world record. Jenner dealt with gender dysphoria throughout her youth but for the most part felt unable to openly express herself. She feared losing her right to compete as an Olympic athlete as well as facing discrimination or ridicule for transitioning to female, all of which had the potential to hurt her and her family. Only in the past two years has she felt safe enough to achieve such vulnerability. Although Jenner transitioned after retiring from sports, she now teeters between being viewed as an inspiration for hopeful trans athletes and being a rich white woman of privilege lacking understanding of the trans community as a whole. It is never easy being a well-known athlete and a trailblazer. One of the most visible and effective change agents for transgender athletes is trans man Chris Mosier. He has always loved sports but was frustrated by the lack of visible role models for transgender athletes. And as a triathlete and sprint duathlete (run, bike, run), he was also frustrated by restrictive trans competition rules due to a lack of basic knowledge. So he created the website TransAthlete.com as a resource to educate and help other trans athletes. But it was Chris’ seventh-place finish in the men’s 35-39-age-category at the Duathlon National Championship in June 2015 that propelled his desire to change the rules for trans athletes into overdrive. In a ground-breaking moment, Chris earned a spot on the national men’s duathlon team competing for Team USA. While he was supposedly eligible to participate with his teammates at the 2016 World Duathlon Championship in Spain, it was only IF his sport’s governing body, the International Triathlon Union (ITU) changed their eligibility rules for trans athletes. Fortunately, due to current medical research data and Chris’ willingness to be a visible role model for other trans athletes, in November 2015 the IOC changed its transgender guidelines and the ITU followed suit. Now, for those whose sports use the IOC guidelines, trans athletes are allowed to compete without having the previously-required external and internal gender reassignment surgeries and their HRT time requirement has also been lowered from two years to one. While no openly transgender athletes competed during the 2016 Rio Olympics, these policy changes set a new, inclusive standard for many sports. Regardless of how athletes express their gender identity or what transitioning steps they take, all athletes have the potential to qualify. In a 2012 survey of LGBTQ youth, nearly 10 percent of respondents reported identifying as “transgender” or “other,” with the latter category featuring non-binary, genderqueer and additional identities on the spectrum between male and female. Young athletes are much more open and self-aware of their gender identity than older generations. And they are in desperate need of trans athletes as role models. When children and young adults see people like them accomplishing great athletic feats, they’re more likely to believe in their own athletic abilities and goals. In Chris Mosier’s case, he began his transition to male in 2010 after one year of competing as a professional athlete. Although he knew by age four that he was male, his biggest concern about transitioning was whether or not he could continue to compete as an elite athlete; he found no trans athletes he could use as role models. Today, Chris lives his life by the motto he reads every day: “Be who you needed when you were younger.” When he earned that spot on Team USA sprint duathlon men’s team for the 2016 World Championship, he became the first openly trans athlete to join a U.S. national team of his identified gender. In addition to his athletic achievements, Mosier also works with LGBT sports leagues to improve transgender inclusion. Currently he is vice president of program development and community relations for the You Can Play Project, an organization that ensures the safety and well-being of all athletes, including LGBTQ players. He is now more widely known after being featured in a Nike advertisement during the 2016 Rio Olympics and that same year was also chosen as the first transgender athlete to be featured in ESPN The Magazine’s Body Issue. If anyone gives hope to trans athletes hoping for a spot in professional sports, Chris Mosier’s successes bring great encouragement. As for Zander, he doesn’t draw inspiration from one particular role model but instead admires a variety of people. “I like to draw inspiration from anyone who is an athlete,” he said, “because we all have different stories, and sports have influenced everyone’s life differently.” Trans, cis, or somewhere in-between, every athlete brings unique strengths and abilities to the table. What matters isn’t how players expresses their gender but whether their gender identity is supported enough to give them a fair chance playing the sport they love. Although the uphill climb for transgender athletes has not ended, they have every reason to be hopeful. With elite transgender athlete role models like Chris Mosier and local trans advocates like Zander to admire, the path for transgender athleticism is becoming more visible. And it is that visibility that continues to improve environments for future transgender athletes.